Anyone who has ever cared for a child knows that all children require discipline, and parenting standards today mandate that all caregivers use positive discipline by setting rules and limits for behaviour and then following up with reasonable consequences when children misbehave. Day nurseries are wise to establish discipline policies for all of their employees to follow that fall within the guidelines of positive reinforcement and respectful correction. In order for them to behave well, children need to be made aware of what is expected of them. Discipline is about training kids to understand the difference between right and wrong, rather than doling out punishments for misdeeds. Establishing rules and standards of behaviour can start when kids are very young, helping them to form good habits early on. Of course, younger children cannot be expected to behave as consistently as older ones, but by posting and enforcing centre rules, children will gradually learn to conduct themselves in appropriate ways. Because children of different ages are capable of varying degrees of understanding and self-control, it is reasonable that disciplinary measures be tailored to fit each child’s age and maturity. Very young children can often be simply redirected to a different activity when they are doing something that caregivers would rather that they didn’t. Preschool aged kids are more capable of understanding that their actions are directly related to consequences, so utilising time-outs as a means of discouraging naughtiness can be quite effective. By the time that they are school aged, children usually have a clear understanding of what constitutes appropriate behaviour, so when they choose to disregard the rules, they are often simply testing their limits and are unlikely to be surprised when their actions result in a loss of privileges. Children who are kept engaged and busy with interesting projects are less likely to misbehave than those who are allowed to get bored, so smart caregivers do all that they can to keep the children occupied with activities that stimulate their intellects, allow for creative expression, and burn up some of the natural energy of childhood. It is far wiser (and more pleasant!) 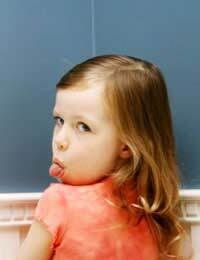 to reward children for good behaviour than it is to try to rein in an out-of-control child. Employees of day nurseries need to remember that their jobs entail more than simply minding the kids; they are also providing a first line education from which the children will learn and grow. By operating from an attitude of respect and positive reinforcement, caregivers can show children by example that kindness and good behaviour are appropriate and appreciated. Carers should be quick with compliments when they see children behaving well, and should look for opportunities to reward desired actions. Something as simple as a smile can go a long way toward keeping kids behaviour in line. Sometimes, children who show that they are capable of behaving well in a day nursery environment choose to exhibit less appropriate behaviours when they are in the presence of their parents. This can be exasperating for parents, who often return tired after their workday, wanting only to enjoy the evening with their families. When daycare workers and parents work together to provide consistency in discipline and standards of behaviour, they often find that the children respond with an overall improvement in rule compliance. It can be beneficial for parents to be provided with a written copy of the discipline policies for the centres that their children attend to keep on file, with daily updates being offered so that parents are aware of how their children did on any given day.